Lake Sturgeon are considered a species of conservation concern in most waterbodies in North America due to habitat degradation, poor water quality, barriers to migration, and harvesting of both adults and eggs. These charismatic fish have strange looking faces, shark-like bodies, and armor-like scales. A female Lake Sturgeon captured on a tributary to the Rainy River. 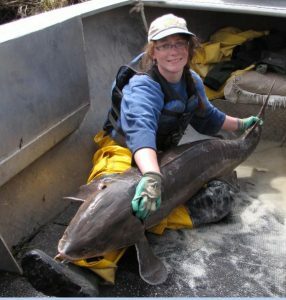 The sturgeon was nearly the same length as the Biologist holding it. Photo credit: A. McLean. Lake Sturgeon have whiskery structures located near their ventral mouths. These whiskery structures are called barbels and sturgeon use them to help sense or taste the environment around them; a handy attribute when you live at the bottom of a waterbody where there is little light. A freshwater fish considered a relic of ancient times, Lake Sturgeon can grow longer than your average NBA player and females can take as long as 30 years to sexually mature! The habitats Lake Sturgeon need to survive each of their life stages are fairly specific, which perhaps has contributed to the decline in their numbers. They typically spawn in spring over rocky areas in shallow water. They can be found spawning in places like rapids or below waterfalls where deposited eggs receive well oxygenated waters. A group of researchers led by Michael Power from the University of Waterloo, Canada studied the spawning habitat requirements of Lake Sturgeon in the Rainy River, a large river connecting Rainy Lake and Lake of the Woods that intersects the Ontario, Canada and Minnesota, USA border. They conducted their research below the International Falls Dam located in Fort Frances, Ontario. 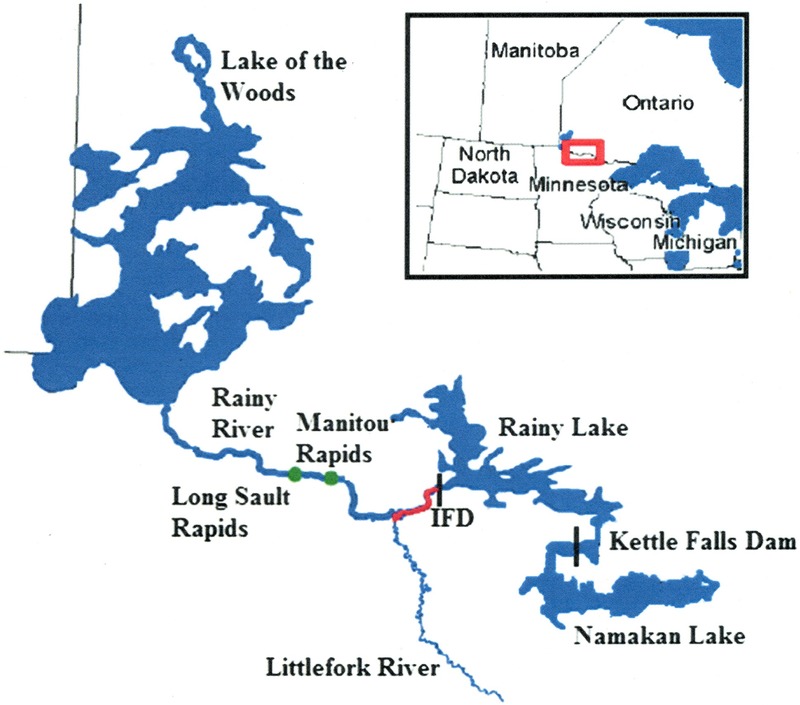 The study was conducted on the Rainy River, Ontario, Minnesota border below the International Falls Dam (IFD). Image taken from Smith et al. 2017. They found that Lake Sturgeon in the Rainy River spawned during late spring and early summer at this dam. The researchers also found that sturgeon at these locations spawned over coarse rocky material such as bedrock, boulders, and cobble. The group reported that Lake Sturgeon at this site spawned in a wider range of water velocities and depths than had been previously recorded for this species in other studies, and that spawning success was greater at higher water velocities. As water levels are regulated by the International Falls Dam at this location, water levels could fluctuate significantly due to water management practices. The researchers found that the habitat available to Lake Sturgeon increased when water levels below the dam were higher. However, the possibility of water levels changing during the spawning season due to water management requirements of the dam could prove problematic for Lake Sturgeon. First, Lake Sturgeon may move into areas and lay their eggs when water levels are high, but these areas could quickly become dewatered if water management practices require more water be held back by the dam. Second, the area of available spawning habitat may be constricted if water levels below the dam remain low during the Lake Sturgeon spawning season. This research suggests that water management practices at dams should be closely monitored and potentially adjusted during fish spawning seasons at locations where fish species present are likely to spawn below dams in areas of high water velocities. The decisions regarding water management practices will likely depend on the value of the fish and fisheries that could be impacted. Smith, A., Smokorowski, K.E., and Power, M. 2017. Spawning lake sturgeon (Acipenser fulvescens Rafinesque, 1817) and their habitat characteristics in Rainy River, Ontario and Minnesota. Journal of Applied Ichthyology 33(3): 328-337.